Johan Giampietro was educated at the Technischen Hochschule in Vienna and also attended the Conservatory in Vienna. In 1886 he started his career as an actor in Budapest and after engagements in several other cities before he was engaged at the Deutschen Volkstheater in Vienna and the Theater an der Wien in the same city. He also worked for the Deutschen Schauspielhaus and the Neue Theater in Hamburg. He was among the most popular comedians of his time and a direct rivel to Alexander Girardi. In 1909 he was in the movie "Don Juan heiratet". He had the reputation of a ladykiller and he married the actress Ella Funk (b. 10 Feb 1872). 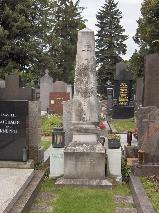 The grave of Josef Giampietro at the Hietzing Cemetery in Vienna.